When the ghost of Santi Cazorla is out here scoring braces on you for a team in the relegation zone, maybe your season’s not going so hot. And so, while the rest of the soccer world was watching the Manchester City-Liverpool banger, Real Madrid were busy writing the newest chapter of their disappointing 2018-2019 season, barely carving out a point against 17th-placed Villareal. It’s the latest ignominy to befall the Spanish giants, who now sit in fourth place in La Liga, seven points behind perennial rivals Barcelona. Their goal difference is a meager +5, and they’ve scored only 26 goals—two fewer than mid-table sides Levante and Celta Vigo. 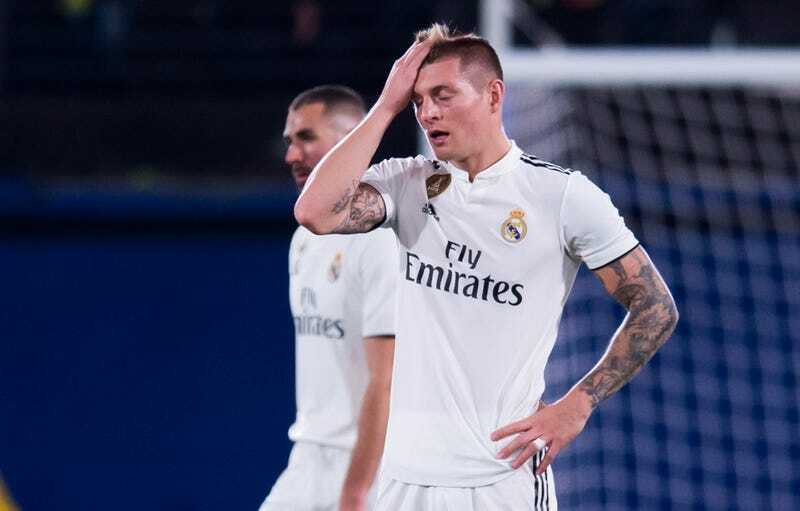 Maybe worse than that, for a club with the aspirations to be the most marketable side in the world, is that Real Madrid matches are no longer must-watches; in fact, they’re quite boring affairs. It all starts with the departure of Cristiano Ronaldo. Losing one of the best players in the world—one who scored 44 goals in 44 appearances last season no less—was always going to hurt, but Real did very little to offset the departure of their all-time leading goalscorer. The club’s incoming transfers this summer were either luxury purchases—why do you need Thibaut Courtois when you have Keylor Navas?—or simply bewildering; Mariano Diaz was clearly not Madrid quality, and his one goal in a measly 10 appearances this season seems to back that up. Perhaps most egregiously, Real Madrid president Florentino Perez dropped a cool $69.5 million on Brazilian teenager Vinícius Júnior, who has shown potential but is clearly not ready for the bright lights of the Spanish capital. Whether because he saw something in the 18-year-old, or because he wants to make sure to never miss out on the “next Neymar,” Perez dropping that chunk of change on a raw winger in favor of rather than in addition to a proven goalscorer is nigh unforgivable. But maybe the roster isn’t the actual problem; after all, you don’t go from four Champions League trophies in five years to mediocre due to the loss of one player, even one as historically great as Ronaldo. Madrid still has a plethora of stars at its disposal: Marcelo, Raphael Varane, Dani Carvajal, Toni Kroos... the list goes on and on. Even with the always-injured Gareth Bale missing time yet again—he picked up a knock against Villareal and will miss at least three games—and supposed “best player in the world” Luka Modric looking like a shell of his World Cup self, Real should at least be competent enough to not need to fight for a Champions League spot. And so it goes back to Florentino Perez. After Zinedine Zidane peaced out this summer, Perez’s response was to hire a manager no one liked and give him less than half a season to transition the team into a new era. Julen Lopetegui is the epitome of failing upwards; his tenure at Porto made him a hated man in the eyes of the club’s supporters, while his time as head of the Spanish national side ended in hilarious fashion on the eve of the World Cup. Once he was swiftly and unsurprisingly shown the door at Madrid, the club appointed Santiago Solari, a former player whose best managerial experience was at the head of the club’s B team. While he’s won 11 of his first 14 matches at the head of the senior team, his record has been padded by a softer schedule, including the Club World Cup, a veritable feast for Europe’s biggest teams year in and year out. That opening run also includes a brutal 3-0 loss to tiny Eibar in the league, and multiple 1-0 wins against sides you would expect Real Madrid to thump. During Thursday’s match against Villareal, Solari continued to show a lack of understanding for how to manage a game. With his team on the defensive, trying to protect a 2-1 lead, Solari took out Modric in the 64th minute for 20-year-old Uruguayan Federico Valverde. Madrid was already struggling to hold on to possession, yet Solari decide to concede even more of it by taking out his most accomplished possession player; Villareal promptly scored in the 82nd minute to get the point. It’s just one game, sure, and even one bad season isn’t the end of the world for a club of Real Madrid’s stature. They just had the most successful continental run in decades, so struggling after losing both the architect of that success (Zidane) and the wrecking ball at the center of its attack (Ronaldo) isn’t shocking or particularly concerning. It’s just sad, because it didn’t have to be this way. Despite a lack of proven depth, there is enough talent here to compete, both abroad and at home. Instead, La Liga is pretty much out of the club’s reach already and they are, somehow, underdogs against Ajax in the round of 16 of the Champions League. Even if the club makes a late-season push in the league, and even if they manage to claw past Ajax and into the quarter-finals, it’ll be hard to see any Madrid fans—usually a demanding bunch—cutting the club some slack. It will be even harder to do that if Madrid doesn’t have a successful transfer season this summer, and that begins and ends with one name: Eden Hazard. Sure, more ambitious and/or deluded Madridistas will call for Neymar or Kylian Mbappé, but the Chelsea man is rightfully at the top of Perez’s shopping list. If he’s able to nab the Belgian and bring him to the Bernabeu, it would give Madrid a veritable superstar forward, one who can both score goals himself and set up easy chances for his teammates. There are other potential upgrades the side could make to propel them back to Europe’s elite tier. Lazio’s Sergej Milinkovic-Savic could step in to start in the midfield from day one, particularly if and when Modric leaves this summer, while the buzz has begun for a possible Kalidou Koulibaly transfer; the big Napoli center back will be one of the most coveted players this summer, though he will likely cost upwards of $100 million. Those are the stakes for Real Madrid next summer, but for now, Solari and co. will probably look to minimize the damage. A run to the Champions League quarterfinals and a top 3 finish in La Liga will likely quell the burgeoning melancholy around the side, and a shiny new manager hire this summer—Mauricio Pochettino, anyone?—will give Madridistas a new sense of hope. In the meantime, there will likely be more games like Friday’s, where Madrid’s talented players will continue to slog against coordinated sides playing out of their minds. For fans of 19 other La Liga teams, seeing the white giant falter must be refreshing, but it could be an “enjoy it while you can” situation. The struggles will likely give way under the weight of millions and millions of dollars this summer.